There’s something satisfying about a clean environment and knowing that you’ve taken care of bacteria and viruses that can be found on many surfaces in your home. It can be as simple as choosing the best essential oil for chemical-free cleaning. There are many recipes that can take care of the same germs as commercial cleaners, but skip chemicals for something much healthier. Not only do the cypress trees make beautiful hedges with a mild and pleasant evergreen smell, but oil produced from their needles has also been found to have significant antiseptic and antibacterial properties. (5) This oil can be used to kill foodborne pathogens in the kitchen, but also other bacteria found in other parts of your house. (6) This oil blends well with lemon and lavender, creating a mix that invigorates and calms while it cleans. Combine equal parts water and cleaning vinegar with 10-20 drops of each oil to create a cleaning solution for the solid surfaces in your home. Eucalyptus is one of my favorite oils. It was used to treat fungal infections and disinfect wounds. Studies show that it is effective against all types of bacteria, so it is versatile when it comes to being used as a cleaning ingredient. (7) Adding 20 drops to water can create a freshening spray that kills airborne bacteria as well as a smell that energizes. (8) Eucalyptus is a popular oil to relieve breathing and help with decongestion. Misting it in the air will not only kill the germs that cause infections but help you breathe easier during the cold season. Over 70 years of research has been done testing all the myriad properties of tea tree oil. It has the documented ability to kill bacteria and fungus. (9) I think tea tree oil may be one of the most versatile oils I’ve ever used. I’ve used it to treat acne caused by bacteria and to help wounds heal faster. When used in conjunction with eucalyptus, the solution can clean away the most common bacteria in your house. It can be mixed with water to create a spray that can be sprayed directly on counter surfaces or on floors before mopping. This herb was considered sacred in parts of the ancient world. In the modern world, it is part of many cleaning products, including those for skin and hair, due to its antiseptic properties. Because of its long time use, researchers have studied its antibacterial properties. (10) Mixing with other oils that share the same properties can be helpful in taking care of all the possible germs you might have in your home. Mix 10-20 drops of rosemary and clove oil with water to create a spray that can be used on counters and carpets. The scent is also energizing as well. This spice not only flavors your food, but it has well-researched effects on viruses like e. coli, salmonella, and s. aureus, viruses which cause a whole host of health issues, especially for digestion. It has been used to treat infections both internally and externally for centuries. (11, 12) Much like its flavor, its aroma is spicy as well, but it can be mixed with other antiseptic essential oils to make the smell milder. Mix 10-20 drops with water to make a spray that you can use directly on solid surfaces and wipe clean. I’m working on teaching my children that helping to clean the house is a part of being family, not just an extra chore we ask them to carry out every so often. This cleaning often includes the least favorite, but most germ-filled, rooms in the house: the bathroom and the kitchen. I have no problem with expected my kids to do some work. My problem comes from the chemical-laden cleaning products I’d been using myself. Most of them contain things with words that are 20 more syllables long and require full hazmat clothing to use. And it seems that everything contains bleach, which is a fairly strong acid. That makes it good at killing things that cause illness, but it also irritates the eyes, the skin, your lungs with hazardous fumes, and can be a significant poison to have sitting around on your bathroom shelf. Water is a universal solvent and completely neutral, unlike acidic bleach or those other chemical irritants. You can also use a bit of vinegar mixed with it to create a super mild acid for more germ-killing ability. My cleaning spray for the kitchen and bathroom is just filtered water and 20 drops each eucalyptus, peppermint, and tea tree oil. Safe enough for my kids to work with and some of the best antibacterial oils available. Sometimes I even use more peppermint, so my kitchen ends up smelling like a candy cane factory. I don’t have to scrub any harder than I do with other cleaners either. I let touch spots soak a little longer and then wipe it right up. My kids love the scent and don’t even realize that all that wonderful peppermint aroma is also helping to energize them to clean a bit more. I call that a win-win. 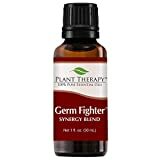 If you want a pre-prepared mix of some of the best germ-fighting essential oils, then this may be the way to go. 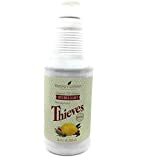 A synergy of lemon, rosemary, clove, eucalyptus, and cinnamon, it can easily be mixed with water or vinegar for a spray that can be used on the solid surfaces of your house. It can also be added to a carrier oil for body applications. It is usually recommended to use a ratio of 1 drop oil to 1 tsp of carrier oil. The product is recommended for application to the feet to prevent illness. Made to be gentle enough to use around the house with kids and pets, this oil contains clove, lemon, cinnamon, rosemary, and eucalyptus. I can only imagine how good that must smell after spraying it on your counters. It is advertised as a concentrate so you will have to make your own mixes to use in a spray bottle. The top essential oils are already together in this one bottle so just use a little with some water or a water/vinegar mix and spray away. You can even use it in your diffuser to kill any germs in the air. A synergy pre-made with some of the best oils for germ killing in the office or at home. 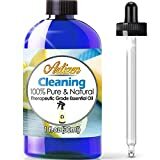 Lemon and lemongrass leave behind that familiar clean smell that you associate with commercial cleaners without any of the chemicals you can’t pronounce. Additional rosemary, eucalyptus, lavender, and tea tree oils contribute their antiseptic ability as well. This is a concentration that can be added to water in your own spray bottle and ready to help keep your home germ free. A few drops in your diffuser can help prevent those airborne germs from spreading further as well. I hope that this list has given you the inspiration needed to change out some of those harsh chemical cleaners in your house and to try making your own with a few drops of essential oil and just a bit of water. You’ll kill germs and leave behind the benefits of many oils. Please be sure to share this if you want your friends and family to enjoy a cleaner home with a more pleasant scent and the same germ-killing ability. Good for you and for your environment at the same time.